Stains and spots are inevitable! 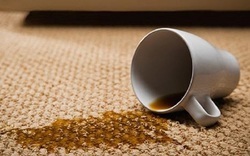 The fact of the matter is, they happen on your carpets whether you want them to or not. Accidents happen, and we at Kingwood Carpet Cleaners know this to be more true than anyone! We embrace accidents, just like we embrace stains and spots, because we know that we can get rid of them and make them disappear! Stains and spots come in many forms, in many different types and many different sizes. Whether the stain or spot is big or small, it might be tough to get out. Some stains can be removed with just water, but some need a more thorough treatment. Even small stains and spots can cause big, big trouble. Some of the worst stains can come in the form of tiny little spots. If you drop an ink pen on a carpet, just the tip of the pen could leave a dark ink stain on your carpet that will be near impossible to remove. You might end up making the problem worse by scrubbing at it, as you will be smearing the ink into more of the carpet fibers. Some stains are bigger, like paint stains or wine stains. With these bigger stains, you might not even have enough cleaning supplies in your cabinet to fully get rid of them. You’ll need to use something more strong and something that comes in bigger quantities. Oftentimes, you don’t have these materials in your home. Kingwood Carpet Cleaning Pros have all of these materials and more. Not only do we have the tools, but we also have the knowledge and expertise to be able to asses the stain and use the proper tools to get rid of them. Each stain should be treated as an individual, as no two stains are alike. Some stains are stronger than others, as they have darker colors or come from a more pungent liquid. All carpets are different, too, and thus react to stains different. Some carpets are shorter and firmer, while other carpets are longer and fluffier, meaning they absorb liquids from stains and spots faster. When you try to get rid of stains and spots on your own, you may be making the problem worse. The best thing you can do for these stains is to hire a professional to take care of the spots. You do not want to run the risk of making your stain and spot even worse than it already was, and you might do just that if you try to tackle it on your own. Stains and spots are nothing to be afraid of. We can take care of them in no time at all, and for a cost that is much less than what you would have to spend if you were to have to buy a new carpet all together. Carpets are expensive and an investment in your home, and we want to make sure that they last as long as they possibly can. No spot or stain has ever been a match for our professional team of carpet cleaners. We are known across the state of Texas to be the best stain and spot removers around, and our staff is known to be fast, friendly, affordable, and great at what we do. Look no further than Kingwood Carpet Cleaning Pros for all of your stain and spot removals. You will not be disappointed with your services and will have a carpet that looks, and feels, as good as new. From Lochshire, Texas you can reach our Office in just 22 minutes car ride.